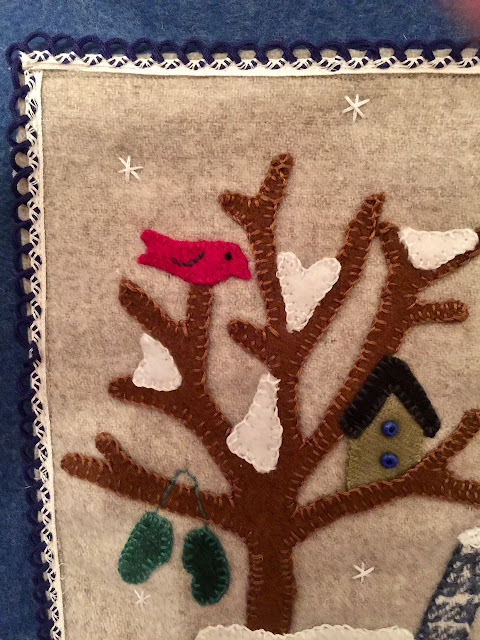 With one eye on the Grammy's, I finished adding some stitched snowflakes to anchor all the layers of this piece. The pattern is from Buttermilk Basin. 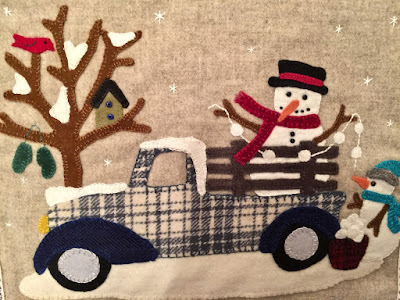 This is the third vintage truck piece that I have stitched; there is something irresistible about them. 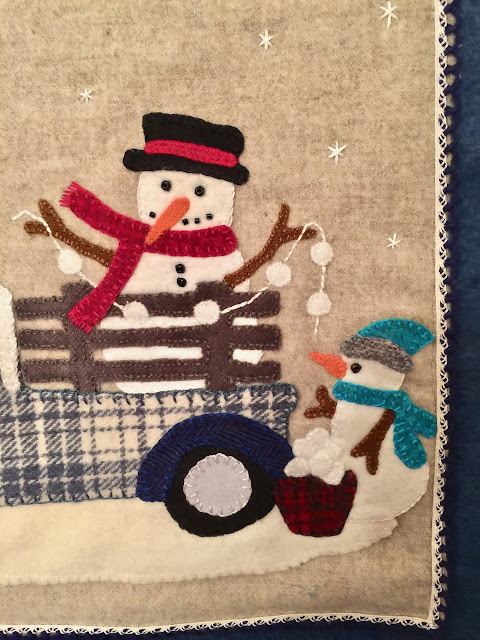 One was a summer piece and the other is a winter piece with sheep which are always irresistible in wool applique. :-) This finished piece measures 19x17." 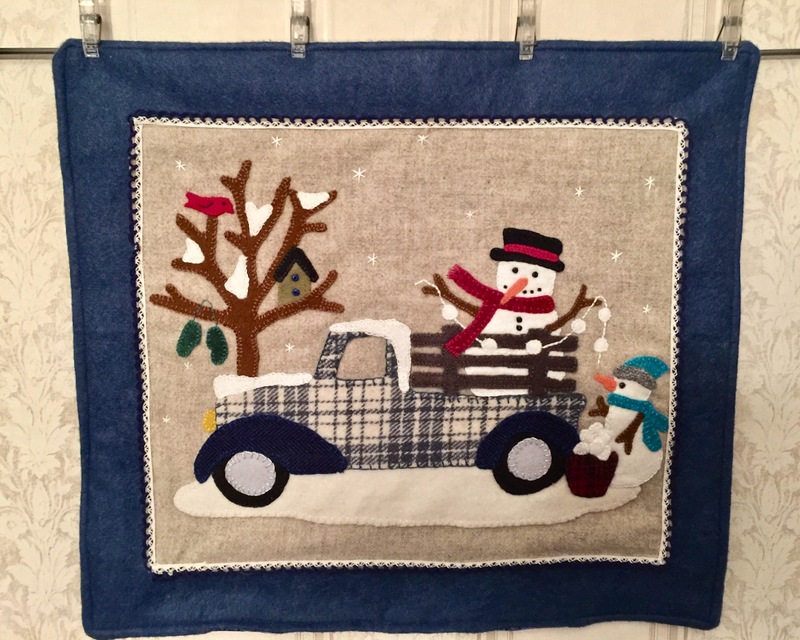 I used a wool batting and a piece of blue batik for the backing and finished it using the pillowcase method. Next I stitched 1/4" around all the edges. The inner edge seam was covered with a length of blue trim that I found in one of my crazy quilt drawers. We have had a strange winter so far with hardly any snow though we are expected to get a few inches late on Tuesday. Folks in the the Northwest and Midwest seem to be bearing the brunt of winter's fury this year. Stay safe and warm wherever you live . . . spring is coming. It is a wonderful piece, well done. Have a wonderful week. After thirty-four wonderful years, I'm now a retired ELA middle school teacher who has totally embraced la dolce far niente, the sweetness of doing nothing. No, that's not true, it's just that now I have the luxury of time to quilt, photograph, travel, get fit, play the flute, and learn Italian. All photos on the pages of this blog are copyrighted. Please do not use them for any purpose without first obtaining permission from me. Leave a comment on the post which has the photo you are interested in, and I will respond. "Goat on a Boat" or "The Lord of the Rings"